You can calculate trends in numeric data and predict values beyond the range of those stored in the data source by using the Forecast feature. Simple moving average. Calculates a series of arithmetic means using a specified number of values from a field. For details, see Using a Simple Moving Average. Single exponential smoothing. Calculates an average that allows you to choose weights to apply to newer and older values. For details, see Using Single Exponential Smoothing. Double exponential smoothing. Accounts for the tendency of data to either increase or decrease over time without repeating. For details, see Using Double Exponential Smoothing. Triple exponential smoothing. Accounts for the tendency of data to repeat itself in intervals over time. For details, see Using Triple Exponential Smoothing. Linear regression analysis. Derives the coefficients of a straight line that best fits the data points and uses this linear equation to estimate values. When predicting values in addition to calculating trends, Forecast continues the same calculations beyond the data points by using the generated trend values as new data points. For the linear regression technique, the calculated regression equation is used to derive trend and predicted values. Forecast performs the calculations based on the data provided, but decisions about their use and reliability are the responsibility of the user. Therefore, Forecast predictions are not always reliable, and many factors determine how accurate a prediction will be. In a recursive Forecast, the Recap field that contains the results is also the field used to generate the Forecast calculations. In this case, the original field is not printed even if it was referenced in the display command, and the Recap column contains the original field values followed by the number of predicted values specified in the Forecast syntax. No trend values display in the report. However, the original column is stored in an output file unless you set HOLDLIST to PRINTONLY. In a non-recursive Forecast, a new field contains the results of Forecast calculations. The new field is displayed in the report along with the original field when it is referenced in the display command. The new field contains trend values and forecast values when specified. Forecast operates on the last Across field in the request. If the request does not contain an Across field, it operates on the last By field. The Forecast calculations start over when the highest-level sort field changes its value. In a request with multiple display commands, Forecast operates on the last Across field (or if there are no Across fields, the last By field) of the last display command. When using an Across field with Forecast, the field must be a summary field. Note: Although you pass parameters to Forecast using an argument list in parentheses, Forecast is not a function. It can coexist with a function of the same name, as long as the function is not specified in a Recap expression. The sort field used for Forecast must be in a numeric or date format. When using simple moving average and exponential moving average methods, data values should be spaced evenly in order to get meaningful results. In a non-recursive Forecast request, use an empty Compute expression prior to the Recap expression. In a recursive Forecast request, specify the options when the field is first referenced in the report request. The use of column notation is not supported in a request that includes Forecast. The process of generating the Forecast values creates extra columns that are not printed in the report output. The number and placement of these additional columns varies depending on the specific request. A request can contain up to seven non-Forecast Recap expressions and up to seven additional Forecast Recap expressions. The left side of a Recap expression used for Forecast supports the CURR attribute for creating a currency-denominated field. Recursive and non-recursive REGRESS are not supported in the same request when the display command is SUM, ADD, or WRITE. Missing values are not supported with REGRESS. If you use the ESTRECORDS parameter to enable the external sort to estimate better the amount of sort work space needed, you must take into account that Forecast with predictions creates additional records in the output. Sorting on dates in any of the smart date formats (based on YYMD). MORE, MATCH, FOR, and OVER phrases. SUMMARIZE and RECOMPUTE are not supported for the same sort field used for FORECAST. A simple moving average is a series of arithmetic means calculated with a specified number of values from a field. Each new mean in the series is calculated by dropping the first value used in the prior calculation, and adding the next data value to the calculation. Simple moving averages are sometimes used to analyze trends in stock prices over time. In this scenario, the average is calculated using a specified number of periods of stock prices. A disadvantage to this indicator is that because it drops the oldest values from the calculation as it moves on, it loses its memory over time. Also, mean values are distorted by extreme highs and lows, since this method gives equal weight to each point. Predicted values beyond the range of the data values are calculated using a moving average that treats the calculated trend values as new data points. The first complete moving average occurs at the nth data point because the calculation requires n values. This is called the lag. The moving average values for the lag rows are calculated as follows: the first value in the moving average column is equal to the first data value, the second value in the moving average column is the average of the first two data values, and so on until the nth row, at which point there are enough values to calculate the moving average with the number of values specified. With the By or Across field you want to use for your calculations, click Forecast. The Forecast dialog box opens. If you want to change the name of the output field that displays the Forecasted values, edit the default name that exists in the Field Name field. Click Moving Average from the Step 1: Choose a Method drop-down list. Select an input measure field from the Step 2: Choose a Measure drop-down list. If you select the same field as the By or Across field, this field will not appear in the output even if it is included in a display command. Select the increment number to count each instance of the By or Across field from the Step 3: Choose The Interval menu. 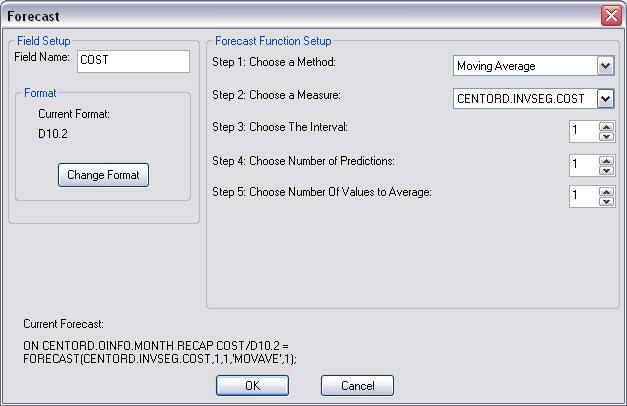 Select the number of predictions to be calculated for the Forecast field from the Step 4: Choose Number of Predictions menu. Select the number of values to average from the Step 5: Choose Number Of Values to Average menu. Optionally, change the default field format by clicking the Change Format button and selecting a different format from the Format dialog box. The Forecast dialog box is shown in the following image. The Forecast dialog box contains the following fields or options. Is the Forecast field name. Displays the format of the Forecast. Opens the Format dialog box. Double Exponential Average. Accounts for the tendency of data to either increase or decrease over time without repeating. Exponential Average. Calculates a weighted average between the previously calculated value of the average and the next data point. Linear Regression. Derives the coefficients of a straight line that best fits the data points and uses this linear equation to estimate values. Moving Average. Calculates a series of arithmetic means using a specified number of values from a field. Multivariate Regression. Predicts two or more dependent variables using one independent variable. Triple Exponential Average. Accounts for the tendency of data to repeat itself in intervals over time. Is the field to be used to calculate the Forecast field. Is the increment by which to count instances of the By or Across field. Is the number of predictions to be calculated. Is the number of values to use to calculate the average used to predict values. Displays the code created by the Forecast dialog box. Create a new procedure, open with Report Painter, and open the centord.mas file. Select Report at the top of the Report Painter window, then select Define from the drop-down list. The Define dialog box opens. Enter PERIOD in the Field input area, type I2 (Integer format) in the Format input area, then double-click MONTH in the Fields List to add it to the area below PERIOD, then click OK.
Add the PERIOD, REGION, QUANTITY, and LINE_COGS fields to the report. Select the PERIOD field and click the By button. Select the QUANTITY field and click the Sum button. Click the Where button from the Where/If button. Select REGION from the Data section. Enter REGION EQ 'WEST' Advanced section, and click OK. In the Field Name field, enter MOVING_AVE. Select Moving Average from the Step 1: Choose a Method drop-down list. Select LINE_COGS from the Step 2: Choose a Measure drop-down list. Specify 1 in the Step 3: Choose The Interval menu. Specify 3 in the Step 4: Choose Number of Predictions menu. Specify 3 in the Step 5: Choose Number of Values to Average menu. In the report, the number of generated values to use for the moving average is 3, and there are no REGION, QUANTITY, or LINE_COGS values for the generated PERIOD and MOVING_AVE fields. The twelfth MOVING_AVE value (3,579,303.67) is equal to the average of the LINE_COGS values for PERIODs 10, 11, and 12. The calculation is (3,786,505.00 + 4,427,791.00 + 2,523,615.00)/3. The thirteenth MOVING AVE value (3,510,236.56) is equal to the average of the LINE_COGS values for PERIODs 11, 12, and 13 (where the twelfth MOVING_AVE value is substituted for the zero LINE_COGS value for PERIOD 13). The calculation is (4,427,791.00 + 2,523,615.00 + 3,579,303.67)/3. The fourteenth MOVING AVE value (3,204,385.07) is equal to the average of the LINE_COGS values for PERIODs 12, 13, and 14 (where the twelfth and thirteenth MOVING_AVE values are substituted for the zero LINE_COGS values for PERIODs 13 and 14). The calculation is (2,523,615.00 + 3,579,303.67 + 3,510,236.56)/3. The fifteenth MOVING AVE value (3,431,308.43) is equal to the average of the LINE_COGS values for PERIODs 13, 14, and 15 (where the thirteenth and fourteenth MOVING_AVE values are substituted for the zero LINE_COGS values for PERIODs 14 and 15). The calculation is (3,579,303.67 + 3,510,236.56 + 3,204,385.07)/3. The single exponential smoothing method calculates an average that allows you to choose weights to apply to newer and older values. The following formula determines the weight given to the newest value. Is an integer greater than one. Increasing n increases the weight assigned to the earlier observations (or data instances), as compared to the later ones. This means that the newest value from the data source is multiplied by the factor k and the current moving average is multiplied by the factor (1-k). These quantities are then summed to generate the new EMA. Note: When the data values are exhausted, the last data value in the sort group is used as the next data value. Select Exponential Average from the Step 1: Choose a Method drop-down list. Select an input field from the Step 2: Choose a Measure drop-down list. If you select the same field as the By or Across field, this field will not appear even if it is included in a display command. Select the increment to count each instance of the By or Across field from the Step 3: Choose The Interval menu. Is the number of values to use to calculate the average that is used to predict values. Click Report at the top of the Report Painter window, then click Define from the drop-down list. Enter REGION EQ 'WEST' in the Advanced section, and click OK. In the Field Name field, enter EXP_AVE. Click Exponential Average from the Step 1: Choose a Method drop-down list. When the report is run, the forecasted single exponential values will appear in the EXP_AVE column. In the report, the number of values used for each single exponential average is 3, and there are no REGION, QUANTITY, or LINE_COGS values for the generated PERIOD and EXP_AVE fields. Double exponential smoothing produces an exponential moving average that takes into account the tendency of data to either increase or decrease over time without repeating. This is accomplished by using two equations with two constants. These two equations are solved to derive the smoothed average. The first smoothed average is set to the first data value. The first trend component is set to zero. For choosing the two constants, the best results are usually obtained by minimizing the mean-squared error (MSE) between the data values and the calculated averages. You may need to use nonlinear optimization techniques to find the optimal constants. Is the number of time periods ahead for the forecast. Select Double Exponential Average from the Step 1: Choose a Method drop-down list. Select the number to use to calculate the weights for each term in the trend from the Step 6: Choose The Number of Values For Each Trend menu. Is the number used to calculate the weights for each term in the trend. In Field Name field, enter DBL_EXP_AVE. Click Double Exponential Average from the Step 1: Choose a Method drop-down list. Specify 2 in the Step 6: Choose The Number of Values For Each Trend menu. When the report is run, the forecasted double exponential values will appear in the DBL_EXP_AVE column. In the report, the number of values used for each double exponential average is 3, and there are no REGION, QUANTITY, or LINE_COGS values for the generated PERIOD and DBL_EXP_AVE fields. Triple exponential smoothing produces an exponential moving average that takes into account the tendency of data to repeat itself in intervals over time. For example, sales data that is growing and in which 25% of sales always occur during December contains both trend and seasonality. Triple exponential smoothing takes both the trend and seasonality into account by using three equations with three constants. For triple exponential smoothing you, need to know the number of data points in each time period (designated as L in the following equations). To account for the seasonality, a seasonal index is calculated. The data is divided by the prior season index and then used in calculating the smoothed average. The three constants must be chosen carefully. The best results are usually obtained by choosing the constants to minimize the mean-squared error (MSE) between the data values and the calculated averages. Varying the values of npoint1 and npoint2 affect the results, and some values may produce a better approximation. To search for a better approximation, you may want to find values that minimize the MSE. Is the number of periods ahead for the forecast. Click Triple Exponential Average from the Step 1: Choose a Method drop-down list. Select the number of data points for a period from the Step 5: Choose The Number of Points Per Period menu. Select the number of values to average from the Step 6: Choose Number Of Values to Average menu. Select the number to use to calculate the weights for each term in the trend from the Step 7: Choose The Number of Values For Each Trend menu. Select the number to use to calculate the weights for each term in the trend from the Step 8: Choose The Number of Values For Seasonal Adjustment menu. Is the number of data points in a period. Is the number used to calculate the weights for each term in the trend. This value is available only for Double Exponential Average and Triple Exponential Average. Is the number used to calculate the weights for each term in the seasonal adjustment. In the Field Name field, enter TRPL_EXP_AVE. Specify 3 in the Step 5: Choose The Number of Points Per Period menu. Specify 3 in the Step 6: Choose Number Of Values to Average menu. Specify 3 in the Step 7: Choose The Number of Values for Each Trend menu. Specify 3 in the Step 8: Choose The Number of Values for Seasonal Adjustment menu. When the report is run, the forecasted triple exponential values will appear in the TRPL_EXP_AVE column. In the report, the number of values used for each triple exponential average is 3, and there are no REGION, QUANTITY, or LINE_COGS values for the generated PERIOD and TRPL_EXP_AVE fields. Is the slope of the line. REGRESS uses a technique called Ordinary Least Squares to calculate values for m and b that minimize the sum of the squared differences between the data and the resulting line. The following formulas show how m and b are calculated. Is the number of data points. Is the data values (dependent variables). Is the sort field values (independent variables). Trend values, as well as predicted values, are calculated using the regression line equation. Click Linear Regression from the Step 1: Choose a Method drop-down list. Enter PERIOD in the Field input area, type I2 (Integer format) in the Format input area, then double-click MONTH in the Fields List to add it to the input area below PERIOD, then click OK. The Define dialog box closes and you return back to Report Painter. In the Field Name field, enter LINEAR_REG. Select Linear Regression from the Step 1: Choose a Method drop-down list. When the report is run, the forecasted linear regression values will appear in the LINEAR_REG column. In the report, the number of values used for each linear regression value is 3, and there are no REGION, QUANTITY, or LINE_COGS values for the generated PERIOD and LINEAR_REG fields. You can use Forecast multiple times in one request. However, all Forecast requests must specify the same sort field, interval, and number of predictions. The only things that can change are the Recap field, method, field used to calculate the Forecast values, and number of points to average. If you change any of the other parameters, the new parameters are ignored. If you want to move a Forecast column in the report output, use an empty Compute expression for the Forecast field as a placeholder. The data type (I, F, P, D) must be the same in the Compute expression and the Recap expression. To make the report output easier to interpret, you can create a field that indicates whether the Forecast value in each row is a predicted value. To do this, define a virtual field whose value is a constant other than zero. Rows in the report output that represent actual records in the data source will appear with this constant. Rows that represent predicted values will display zero. You can also propagate this field to a HOLD file. This example calculates moving averages and exponential averages for both the DOLLARS and BUDDOLLARS fields in the GGSALES data source. The sort field, interval, and number of predictions are the same for all of the calculations. The following example places the DOLLARS field after the MOVAVE field by using an empty COMPUTE command as a placeholder for the MOVAVE field. Both the COMPUTE command and the RECAP command specify formats for MOVAVE (of the same data type), but the format of the RECAP command takes precedence. In the following example, the DATA_ROW virtual field has the value 1 for each row in the data source. It has the value zero for the predicted rows. The PREDICT field is calculated as YES for predicted rows, and NO for rows containing data.